Over many decades, State and Commonwealth Governments have supported the farming community in South Australia during periods of drought, fires, and other natural disasters. This support has been in a range of forms, including financial, technical and business assistance to help farmers reposition their businesses during difficult times. Since 1971, there has been a dedicated unit to provide and administer various types of support for the farming community. In 1971, the Department of Lands established the Rural Industries Assistance Authority in response to the enactment of the Rural Industry Assistance (Special Provisions) Act, 1971 (Commonwealth). In September 1977, the Authority transferred to the Department of Agriculture and was renamed the Rural Assistance Branch. There have been various Commonwealth-State agreements relating to the provision of financial assistance to the Rural Sector. During the 1970s and 1980s, the preferred assistance vehicles were grants and highly concessional, long-term loans. In the 1980’s a new loan scheme was introduced, aimed at supporting better performing farm businesses by offering competitive commercial rates. In acknowledgement of this change in role, the Branch was renamed the Rural Finance & Development Division (RF&D) in 1990. Following an independent review of operations in 1994, the lending program was limited to issuing new loans under the RIADF and Loans to Cooperatives schemes, and to managing the existing loan portfolio to completion. Following the mid-term review of the Rural Adjustment Scheme conducted by the Commonwealth Government in 1997, the nature of Commonwealth-State assistance changed to emphasise farmer development and self reliance through training and education, enhanced farm management deposits and regional support via the Rural Partnership Programs. Interest Rate Subsidies to develop farm businesses were no longer considered as the appropriate method of delivering government support, however remained a key element of the Exceptional Circumstances program. In 2005, a review of RF&D was undertaken, driven by the emerging demand within the agency for prudential services. The review confirmed there was a need to provide PIRSA with a prudential capability. The review recommended an organisational restructure and name change to Prudential & Rural Financial Services (PRFS). PRFS continues to provide administration of various grant and loan assistance programs to the rural sector for both Commonwealth Department of Agriculture Fisheries and Forestry and PIRSA. Between 2000 and 2010 PRFS continued to administer a number of new programs that included regional programs for the pastoral, northern cropping and Riverland in the early part of the decade. The programs supported on-farm development and business planning, all with viability and sustainability outcomes. Another key program during this decade was the national FarmBis grant program which supported training activities to improve farmer business management skills. PRFS also administered financial assistance programs for other State government agencies including the Branched Broomrape grants and loans and grants under the South East Confined Aquifer Wells Rehabilitation scheme. Drought support provided for pastoral areas in need. 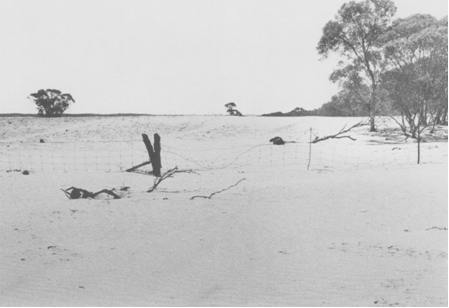 For example, wind erosion at Peebinga in 1983. Drought support for pastoral areas commenced in 2003 and continues in 2011. Between 2007 and 2010 PRFS played a key role in the State Drought response program which included most of the State being declared eligible for financial support under the Exceptional Circumstances program. Grants were also available under the Planning for Recovery program which funded business planning and on-farm development activities. The State Drought response also included grants for community activities to support morale and wellbeing, and farm debt mediation grants. PRFS also undertook an administrative role in 2009 and 2010 to ensure the critical survival needs of irrigated perennial crops were met, by aiding access to additional water allocation.